Ahead of our Poetry Prize, which closes 30th June, we spoke to judge Rebecca Perry about prizes, publication and what she’ll be looking for from this year’s entries. Rebecca, It’s lovely to have you as a judge, particularly as your 2012 pamphlet little armoured was published by Seren after winning the Poetry Wales Purple Moose Poetry Prize. What was your reaction to winning the Prize and how did it help you in your development as a poet? It feels like a lifetime ago! If I’m completely honest I don’t think I fully appreciated at the time what having a pamphlet published meant, how it opens doors to readings and possibly a first collection etc. It’s only looking back that I realise it was the start of something, and how fortunate I was. The flipside was that I didn’t feel any pressure or have any expectations – never a bad thing. It was also helpful as a process and as something to look back on when I started working on the book – a sort of compendium of poems that I could consider and weigh up, deciding what worked and what I’d never do again. Your collection, Beauty/Beauty, published last year, was shortlisted for both the T.S. Eliot Prize and the Fenton Aldeburgh First Collection Prize, as well as being a Poetry Book Society Recommendation. Can you tell us a bit about the nomination process, as well as the aftermath of the success of the book? I’m healthily cynical about prizes and accolades, I think, in terms of the inherent limitations of a small group of people deciding what is ‘the best’. The fact is that lots of wonderful books get very little attention and lots of terrible books get a lot. Having said that, I’m well aware that a lot of the success of the book (in terms of sales, reviews and bookings for readings etc) is solely down to the Eliot shortlisting, and very grateful for it. It’s a huge deal – one day you’re sitting in the park alone working on a manuscript, eating gherkins from a jar, and then another your face is being projected onto a huge screen at the back of the Royal Festival Hall. Most contemporary poets juggle a full-time job with writing. Do you have a routine which incorporates writing or do you take the opportunity when it presents itself? I’ve worked full-time ever since I graduated, so fitting writing in around work is very normal for me. I work as a writer for a charity, which is very stress-free – ‘being a poet’ floats around that quite nebulously and it leaves me lots of time to do readings and travel for festivals. In terms of writing, I don’t have a routine at all – that would just stress me out (I’ve been writing very little for quite a long time) – but if I am writing I’ll tend to take myself off alone and not come back for a while. Do you have any advice for poets entering their work into competitions? Hmm, I suppose sometimes it’s worth taking a risk on what you’re submitting, in terms of not going for what feels like the ‘safe’ or ‘accomplished’ option? It’s very often the stranger poems that you throw in at the last minute that end up getting a result. 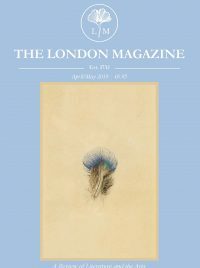 Without being too prescriptive, is there anything you’ll be looking for from entries into this year’s London Magazine Poetry Prize? I generally get excited by poems that seem preoccupied with making a connection with the reader/the world, and going about it abstractly or strangely, with spikiness and energy. Writing that seems aware of itself as Poetry, or poems that flex their formal or linguistic accomplishments are rarely interesting to me. I much prefer freshness and sense of honesty (though not necessarily confessionalism) that you can’t quite put your finger on. Could you tell us three things you’re reading/watching/listening to/thinking about/generally digging at the moment? If a Leaf Falls Press, set up by Sam Riviere, is publishing excellent and beautifully made pamphlets in very limited print runs. I finally got round to reading Madness, Rack and Honey, Mary Ruefle’s Collected Lectures, on a recent holiday and loved it. 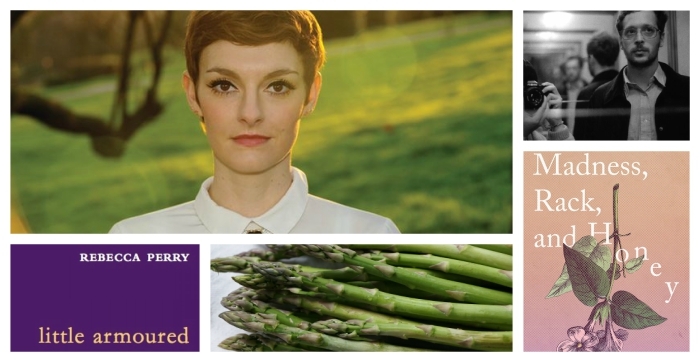 Also, British asparagus is in season at the moment so I’m eating that basically every day. For information on entering our Poetry Prize, click here. Rebecca Perry’s pamphlet, little armoured, was published by Seren in 2012 and won the Poetry Wales Purple Moose prize and was a Poetry Book Society Choice. Her first full collection, Beauty/Beauty, was published by Bloodaxe in January 2015 and is a Poetry Book Society Recommendation, and was shortlisted for the Fenton Aldeburgh Prize for Best First Collection and the T S Eliot Prize. She co-edits the online journal Poems In Which and is Writer Fellow at Manchester University.